Late last year, Facebook first rolled out the ‘coloured status’ feature on its Android app that allowed users to post their status with a colourful font, background, and emoji combination. Now, WhatsApp seems to be adapting the said feature on its app. According to a report by Android Police, the feature was spotted on the WhatsApp version that is currently in beta testing. This WhatsApp beta version 2.17.291 can be accessed by users who have signed up for the WhatsApp’s Official Play Store beta program. This means that the beta users will get their hands on the feature before it is officially rolled out to the public as is the trend with all previous WhatsApp beta versions. The feature is expected to roll out to the mainstream audience in the coming weeks if the testing is successful. However, the report notes that this feature could very well be just a server-side test and chances are it might not even see the light of day. Such a scenario seems unlikely to happen because if a feature is made available for beta users, it will most likely make its way to the general public. WhatsApp will reportedly add a new floating pencil icon above the camera button in the Status tab. Tapping on this icon lets the users upload coloured text statuses, Facebook-style. Similar to what we see on Facebook, the users will have three options – to select a font, add emojis, and choose a background colour. Once designing the colour and text is done, the user can go ahead and click on the green arrow button at the bottom right to post it as their Status for all their contacts to see. Facebook introduced this feature for Android back in December 2016 and currently, it offers more than ten background colour options to choose from – including white, green, yellow and orange gradient, red-orange, green and blue gradient, and more. This feature is only for posting texts and does not work for links images or video-posts. We will have to wait and see what WhatsApp has in store for us in this regard. Facebook-owned WhatsApp has recently announced a total of 1.3 billion monthly active user base. 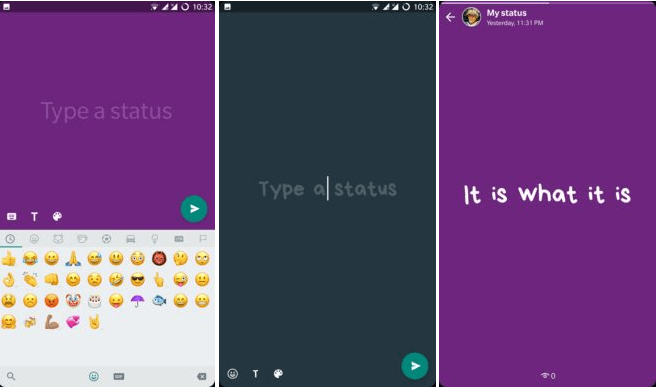 The revamped WhatsApp Status feature, which is a clone of Snapchat’s Stories, was launched in February and has over 250 million daily users posting Status stories on the app. Those interested in testing this feature out can enrol in the beta program or alternatively download the APK version from the web.